An epidemic of acute conjunctivitis in Dar es Salaam in 2010 demonstrated the importance of a strong infectious diseases epidemiological surveillance network to minimise disease outbreaks. Misunderstanding of the causes and management of diseases explains the repetitive nature of acute haemorrhagic conjunctivitis (AHC) in Dar es Salaam. 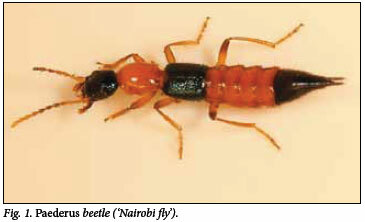 This paper discusses AHC and Paederus spp. keratoconjunctivitis and periorbital oedema ('Nairobi red eyes') that are confused as being associated with recurrent epidemics of conjunctivitis in Dar es Salaam. In Tanzania, Paederus dermatitis and conjunctivitis occurs mainly during the rainy season (March and October) in the north (Kilimanjaro and Arusha),20 with no cases in the coastal region, so excluding Paederus (Nairobi fly) as a cause of conjunctivitis in Dar es Salaam, as reported by many. Conjunctivitis from Paederus is rare. The beetle affects mostly the skin after contact with the body and releasing pederin toxins.20 Conjunctivitis results from transferring toxins by finger to the eyes (Nairobi eyes).16-20 The rapid spread and mechanism of transmission of conjunctivitis reported in Dar es Salaam are unlike that of Paederus conjunctivitis, which is slow and occurs rarely. Ocular involvement is usually secondary to rubbing the eyes with hands contaminated with vesicant fluid. Oedema, conjunctivitis and excess lacrimation are common and termed 'Nairobi eyes'.20 The effect of toxins is usually limited to the conjunctiva, and corneal scarring and iritis are rare.20,24 Bilateral Paederus conjunctivitis is uncommon, providing further proof that 'Nairobi fly' is not responsible for epidemics in Dar es Salaam, where most cases were of bilateral conjunctivitis. The magnitude of an epidemic of conjunctivitis in 2010 in Tanzania can be directly linked to enterovirus 70 and coxsackievirus A24. Numerous epidemics have been documented worldwide, and the clinical and epidemiological features of conjunctivitis in Dar es Salaam are similar to those in other countries. Outbreaks of conjunctivitis in Dar es Salaam move rapidly, and are associated with AHC rather than Paederus spp. conjunctivitis ('Nairobi red eyes'). A few cases of gonococcal ophthalmia were reported 1984,4 but increasing numbers of cases have since been reported in Dar es Salaam and neighbouring regions, affecting people living in densely populated areas such as slums.4 The epidemiology and disease trend prove that the infections are likely to be viral or bacterial, and not Nairobi red eye. Viral conjunctivitis, with bilateral involvement with symptoms such as hyperaemia, congestion, haemorrhage, follicles, corneal involvement and lymphadenopathy, was first reported in 1909.26 The first outbreak of AHC caused by enterovirus 70 was in Ghana in 1969 (named 'Apollo' as it coincided with the Apollo XI moon mission).27 From 1969 to 1972, the pandemic disease spread from Ghana across tropical and subtropical Western and Central Africa to the Middle East and other parts of Asia, and remains common today.28 In the Western world, the disease was reported in 1981 when the pandemic (originating from Kenya in 1980) reached South America, Central America, the Caribbean islands and the USA.29,30 Owing to limited investigative facilities, the agent causing epidemics of conjunctivitis in Dar es Salaam since the early 1980s had not been determined. A coxsackievirus A24 causing AHC was first isolated in Singapore in 1970,31 and outbreaks were then reported in America and in the Caribbean after 15 years of being dormant in south-east Asia. The genus enterovirus belongs to the family picornaviridae comprising 66 human serotypes that are classified into 5 groups: (i) poliovirus serotypes 1 - 3; (ii) human enterovirus A (HEV-A), including 11 serotypes of coxsackievirus A and EV 71; (iii) human enterovirus B (HEV-B) with 38 serotypes including all coxsackievirus B, all echoviruses, EV69, EV73, and CA9; (iv) human enterovirus C (HEV-C), including 11 serotypes of coxsackievirus A; and (v) human enterovirus D (HEV-D) with only 2 serotypes - EV68 and EV70. Coxsackievirus A24 belongs to HEV-C.29 This genus, together with adenovirus, is associated with epidemics of conjunctivitis all over the world. 1. Saiboko A. 'Red eyes' again, Dar es Salaam hardest hit. Daily Newsonline 10 July 2010. http://www.dailynews.co.tz/home/?n=11590&cat=home (accessed 12 July 2010).